There is a small windswept island off the west coast. It is a strange land. It’s been compared to a miniature Scotland with rugged hills, sheer cliffs, inland lochs and beaches of all sorts – sandy, stony and slatey. Some days there is a yellow hue as far as the eye can see. Some say it gives a happy glow to their little self-contained world; others say it brings day long nausea. In the not too distance past this peculiar little land, Isle of Gaoth, tended to her flock. Every family had their croft, their own little pocket of loved land. Things changed, as they always do eventually: war came; men left; times were hard. Few flourished in the face of catastrophe, on Gaoth that was the Mulloys. A family of farmers much like any other, but with a keen business sense, a father in a reserved occupation and sons the right side of conscription age. They lay in wait, biding their time, counting their coppers. It wasn’t long before a quiet word here and there trickled through the community. If your man didn’t come back, if your crop failed, if your cow fell ill, there was one option: go to the Mulloys. They would give you coin for your croft and let you stay until – you got your widow’s pension; until your last son grew big and strong; until we won the war; until things got better. All of those untils came to pass as, piece by piece, the island became part of the Mulloy empire. The land grew restless, this was not the way of Gaoth, and so she sought solace. She quaked the third generation. They had three big strapping boys – and then there was Tarquin, a premature baby with undeveloped lungs. Through adversity comes strength, Gaoth knew this. As she knew that Tarquin was not a mere carbon copy, a seemingly lobotomised clone of his predecessors, rehearsing the same motivations and ambitions. He was different, he’d fought to be part of this world. He was her legacy, an ‘all or nothing’ sort of soul. He came into this world silent and stunned on the brink of death, then screamed every waking moment for his first year. He was a small, frail child with a deep sense of foreboding. His father never took to him, taunts and prejudices followed from father to son. Tarquin’s elder brothers learned he was an outsider, an intruding interloper. Yet these differences were paramount to Tarquin, they ignited his spark. He scampered along shores breathing in lung-healing salted air; roamed hills building stamina and muscle; and learned companionship from woodland creatures. But most importantly, he learned strategy by playing chess with Hamish, an old man who spoke to everyone but held secrets wordlessly. His family resented this, though it no longer mattered. Tarquin had trained, he was ready. The bullied became the bully. He systematically – strategically – chose his targets: deflated egos, grated away heightened self-esteems, picked off the weakest. The silent civil war, depleted hatred, crumbled patriarchy – Tarquin soon ran the family business. His adolescent training triumphed that of his childhood, now those lungs smooth-talked businessmen, politicians, even a few royals. He hosted high flyer get-togethers showcasing his self-secured dynasty. Isle of Gaoth does not forget, she coaxed this unlikely alliance at conception. The question of mutuality irrelevant. 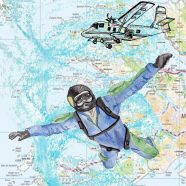 So, when a rather influential guest asked “Have you ever skydived?” she did not guide or nudge as she could so easily have done, instead she mutely listened to “Yes, why of course!” with disgust. Tarquin blindly followed, jumping as those before him did – without thought or judgement. Tempted by the promise of glitter and dreams and novelty further afield. It was off of Gaoth‘s bushy tail end he took on a sudden bout of nausea while taking in the yellow-hued-horizon. Strong winds swept him out over the Atlantic Ocean before Gaoth stepped in – charmed by his youthful spirit, impressed by his adolescent tenaciousness – and brought him home to one of her beautiful black beaches. Thousands of tiny slate skelves parted on impact, hugging his body to the earth, softening the blow. He suffered broken bones, dislocations and an embedded slate skelf in his good knee – the mark of Gaoth. Her mark festered, soundlessly steering Tarquin in a new direction. His character subtly guided and aspirations intertwined: corporate collusion ceased, crofts were gifted back to original owners, following the way of the land. For he was never a half way man, was Tarquin. That is how the Isle of Gaoth quaked the fourth Mulloy generation, how she won the war and kept her flock safe: land and bloodline mingled in a turbulent marriage.